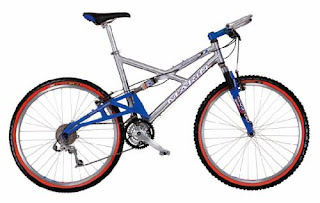 I already owned a mountain bike, but designs had moved on since the 1990's and I knew nothing of the world of full suspension designs. Searching lead me to an excellent review by www.mtbbritain.co.uk and following their recommendations I had a working short list of; Ellsworth, Marin, Santa Cruz or Specialized. I am not a bike snob and for most of my bike riding life have chosen budget brands over the thoroughbred items, but I felt that this was one time where quality was going to matter. I was later to realise that much weight is to be saved by opting for the higher end of the market. I intended to buy just a bare second hand frame for around £150, but after a month, few opportunities had presented themselves. Finally I found a complete Marin East Peak freshly listed on eBay for a "Buy It Now" price of £320. I sent the spec to my biker guru who gave it his stamp of approval. I reasoned that I could sell off unused parts or keep them for summer riding, I hit the button and a few days later a courier dropped off a huge box containing the bike.